My mother gave me her childhood book of fairy tales when my children were young. This wasn’t a book she had ever shown me, or my brother and sisters. I think it was my teaching and my newfound love of children’s literature that prompted her to give me the book. The silence was deafening. I could see the stiffening and the tension, and I wasn’t even there. I could see the eyes tightening and the chin rising, even though I wasn’t there. My mother was a no-nonsense, tough woman. She always idolized her grandfather who was a coal miner from Wales. He came to America, made a fortune in mining in Pennsylvania, lost everything in the depression, and then built his fortune once again. It wasn’t the money, it was the grit her grandfather had that my mother admired. Mother’s father, her beloved grandfather’s only son, was killed in a mining accident when he was in his 30’s. Mother’s mother (Lulu to me) practically fell apart and spent a year in Paris with her children to recover. That year, 1928, they lived in the same apartment building as the famous singer Maurice Chevalier, who often sang to my mother. She was eight years old. A fortune was spent in only a year. My mother watched her mother in weakness. After that, my mother became a very strong woman. When my father, her husband, died as a young man, my mother was able to manage her four children with a positive presence and a stiff upper lip. And that is why she bristled when I told her that her Grimm’s Fairy Tales were violent. Cinderella. Well, in the original Grimm’s story, there is no Fairy Godmother. Instead there is a weeping willow tree by her mother’s grave, and birds. The birds get her the dress for the ball…which lasts for three days. They also pick out the lentils from the ashes for Cinderella so she can go to the ball. The glass slipper. OMG. The evil stepmother tells the first daughter to chop off her toe, and the second daughter to cut off her heel in order to make the glass slipper fit. Of course the blood sends the Prince back to the house each time. When the Prince and Cinderella marry, the birds peck out the stepsisters’ eyeballs. Really. Do you recognize many of these titles? “Little Red Cap” is the original “Little Red Riding Hood.” It has two different endings. I read this to the children at school last week. 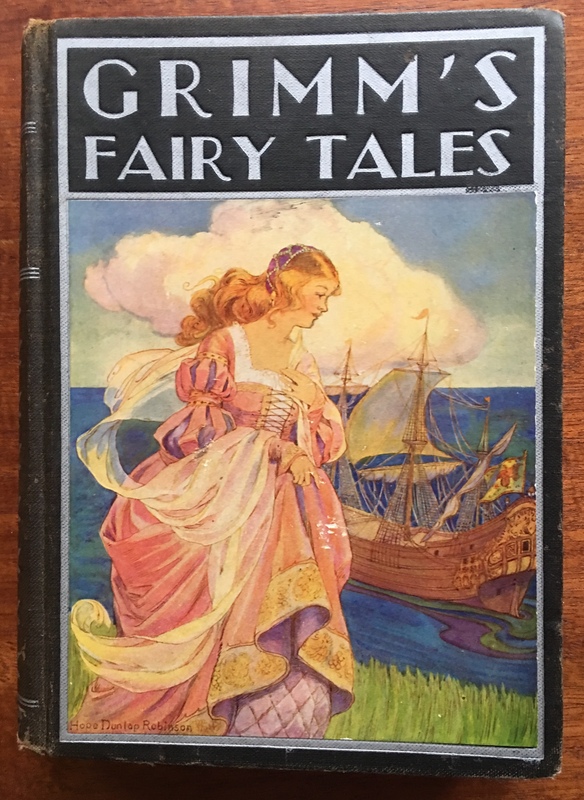 Popular fairy tales are popular to their readers. In the days of the Brothers Grimm, children died, life was hard, disease and terrible working conditions were common. Hot water and a big meal was a luxury. Therefore, those stories were not scary or violent to their readers. Even into the early 1900’s. Today, people think Disney movie adaptations are violent. If my children called me to tell me how violent Disney movies were, I would have been just like my mother; shocked and defensive, and bristling. Shielding children from what happens in life is not the way to go. Storytelling and books and fairy tales are a good thing. This entry was posted in books, children's books, Early Education, Imagination, reading, self esteem, storytelling, Teaching young children and tagged children's books, Early Education, Fairy Tales, Grimm's Fairy Tales, Learning through Fairy Tales, reading books to children, storytelling, teaching young children. Bookmark the permalink. That just demonstrates how we have developed our sensibilities – still got a way to go. Those early fairy tales were really quite horrific. They are inherent in our culture. We have a violent past. We’ve come a long way! Yes, we have come a long way! I enjoyed reading your thoughts, Jennie. Yes, I’ve read a couple of the old Grimm’s stories, and they’re utterly gruesome. However, as you say, different perceptions in different times. Wishing you a terrific Tuesday. Hugs. An interesting take on the issue of violence in the media – print or otherwise. I’ve often wrestled with the question of whether or not we implicitly teach acceptance of violence as a legitimate means when we give our children access to these kinds of stories. As a child, my parents took me and my older brother to a theater in Toronto to see Ben Hur. I was physically nauseated watching that bloody chariot race and my father told me to put my head between my legs and breathe deeply. Now I watch that scene and it doesn’t bother me – it should. Great post, Jennie. Thank you, John. You were scared at the chariot race in Ben Hur? I remember that movie well. I worry deeply about the violence that we see. Video games and TV news feed violence. What we read is different, because there are no pictures. We make the pictures in our head. Stories can only take us as far as our imagination can go. That’s a good thing. Yes, Grimm’s Fairy Tales are violent to me, but not to my mother and those in the early 1900’s. Really interesting. I wasn’t frightened by the chariot race – it was the blood and gore of Mesalla as he was trampled by 3 chariots and lay in the dirt a bloody mess – totally shocked and sickened me. That was terrible. I remember. Yet, we see worse gore in Tv series that depict surgical procedures. We sadly live in a violent world, and it was worse when the Grimms wrote their stories, in 1812. Perhaps the children of today are shielded from such things in literature, and whether or not that is a good thing is not for me to say. We have to grow up fast enough, after all. Your train of thought is interesting and as back-and-forth as mine. Children like to be scared. Adults do, too. I believe that we need to shield them from what they see, like violent video games and some shows on TV. What they hear, the stories, is a far different thing. Words make the pictures in our heads and create the imagination. That’s natural. Make sense? Thanks so much, Pete. Best to you. I think educating children in the changes that have taken place is important. Maybe the old stories help do that, if the process is orchestrated by an adult. Well said, Dan. I couldn’t agree with you more! Jennie, I agree with you and thank you for pointing out what the purpose of age old fairy tales were, inasmuch, as they expressed what their lives were like, as it were – life was hard, children died, and it was a cruel life for many or most. . My grandmother’s fairy tale storytelling was from days of old, but nonetheless, I found it fascinating. I fell in love with fairy tales. I have the complete volume of Grimm’s Fairy Tales and the complete volume of Hans Christian Andersen’s Fairy Tales too. With all the violence of TV, movies, and written works these days, fairy tales are meek compared yo what is out there today. At least with age-old fairy tales that were most often based in what was going on in their society, fairy tales were a safe way to express the stark difference between the haves and haves-not. We have marches, walkouts, boycotts to express our displeasure with society and the old world views were expressed in fairy tales. Hear! Hear! You said it well, Karen. We are all drawn to stories and fairy tales. It’s been that way forever. And they continue to withstand the test of time because their message yesterday is still the message today; good vs evil, strength and courage, etc. The written word holds more power, doesn’t it? Thank you, Karen. And, I need to read all the Hans Christian Andersen tales, too. You are so right, Karen. Fairy tales and fantasy are the root of telling the world the most basic and important ways to be and ways to live. So simple, yet not so simple. They most definitely have made the world a better place to live. While the children in my class might not be well read to before they come to me, they do know fairy tales. That speaks volumes! Yes, thank goodness for fairy tales, children often learn the most from fairy tales about injustice. This is a must read post from Jennie about the real purpose of fairy tales. I agree with you completely. People are strange, they complain that Disney movies are violent and then they let their children play horrible computer games that are much more mindlessly violent and they don’t even know. Exactly, Robbie! You took the words out of my mouth. Well said! Words in stories are far less violent than pictures in video games. In the words of my mother, “You heard all these stories and turned out just fine.” I survived Bambi, too. 🙂 Thanks, Robbie. Apologies for my mistake on your name! Even as a child, I preferred Ashputtel’s hazel tree to the fairy godmother. ‘Shake, shake, hazel-tree, Gold and silver over me! The older tales have more depth than the pretty modern versions…and more to teach too. Yes!! And you remember that chant, those words. I loved reading them, too. The older tales have much more depth and MUCH more to teach. Thank you, Sue. Thank you for another great post, Jennie. 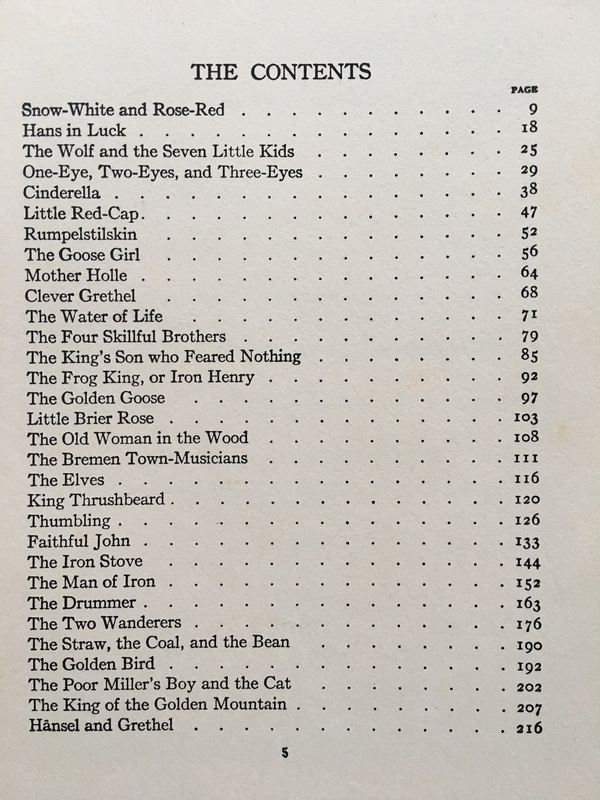 I read all of the fairy tales (paper back and in colored volumes, if I am remembering correctly) edited/written/collected by Andrew Lang as a child. I haven’t read many since then, although I helped a friend (in a very small way) to make a documentary film using the Grimm Cinderella tale as an exploration of loss and healing (http://www.onceuponaloss.com/) — particularly the challenges of healing from the early death of a parent (which it sounds like both your mother AND you experienced…) What a time for your grandmother and mother and her siblings to be in Paris! And how sweet to learn that Maurice Chevalier sang to your mother!! What a special bond you were able to forge after your mother offered an ‘olive branch’ in the form of a favorite book of fairy tales…very touching especially in light of your mother’s characteristic ‘bristly’ personality. I love that she had Maurice singing to her as a child…who can resist that man?! My children like the watered-down and original versions, but they’re also somewhat morbid. Oops, didn’t get to finish. Very cool that she was on Maurice Chevalier’s lap as he sang to her as a child. The generations over time make a tremendous difference in how they view fairy tales, yet the message of the tales remains constant, good vs evil, etc. This is a powerful and insightful post about fairy-tales from different time periods. Once again, Jenny does a wonderful job with her posts. I grew up with these gruesome fairy tales as well as some equally gruesome nursery rhymes, but I didn’t lose sleep over them or grow up to be disturbed or maladjusted. I loved the stories, knowing they were just exaggerated “stories.” What scares me more are ghost stories, horror, and violence for the sake of violence as in today’s video games. You’re absolutely right, Anneli. Like you, I grew up with terrible and scary stories, and I’m as normal and well adjusted as apple pie. The big difference with video games is that there are pictures of all the violence to see. With stories, there are only words, so we create our own images. How terrible, toes and heels chopped off and eyeballs pecked out! That’s some real disturbing fairy tale right there! It’s quite interesting how our tales have developed over time and how our lifestyles have affected these changes. I have just reread the Little Mermaid by Andersen, which I find also pretty cruel and compare it to Ariel in my next blog post. After that I look behind the scenes at this fairy tale country where transformation is the main theme. Of course death is not final in the fairy tale dimension enabling the inhabitants to play out very diverse endings. I will publish on Saturday. May I put in a link pointing to this post? Thank you, Inge. Of course you may put in a link to the post! I haven’t read The Little Mermaid in ages. I must do so again. Thank you for your interesting and vivid post. I had a book of the brother Grimm’s fairy tales and loved the stories……holding out for that good ending.😊 . Read them in Swedish where I grew up. The brothers Grimm where German and not so much writers. They travelled around and collected fairy tales which they collected and edited. So the tales do indeed represent lives in Europe at the time. In a very Fairy Tale way. Jennie, you put it so right. They depict images whilst in a book your own inner self make them. Your reference points is normally softer. Exactly! It makes such a difference. Thanks, Miriam. Reading all the comments here, I suddenly realised that my book Unhappily Ever After in which I take off the fairy tales 200 years after the ball, has no violence in it at all – now I wonder how that happened? They were definitely dark and violent but they were dark and violent for a PURPOSE! Now-a-days there is just violence for the sake of violence. Or the tales are so twisted as to be unrecognizable and the morals are lost to the ages… a great post!! You are absolutely right! There is purpose and goodness and moral dilemmas, all the things a good story needs, especially a dark story. Thank you! I absolutely agree with you – fairy stories are SUPPOSED to be disturbing and violent. It’s how we teach children that Life is often unfair and arbitary. That bad luck and disaster is never far away, no matter how good you are, or how hard you try. The best way to cope is to grit your teeth and prevail, as your mother did – THAT’S what fairy tales teach. Grace under pressure tends to be the underlying moral. I still remember the terror I felt watching Sleeping Beauty — especially when the Prince battles the dragon in the thorns… we got to the theater late and wound up in one of the first rows…and everything was soooooo BIG! As an adult, I watch the same film and feel trepidation even now. But also as an adult, I think the purpose of fairy tales and fantasy is to offer hope in our darkest hours when it isn’t establishing boundaries and consequences of our social interactions — no matter who or WHAT they are with! Well said, KC. I completely agree. And I was scared,too, at that battle scene in the thorns. At least I wasn’t in the front row! This is quite the conversation here. Unlike the rest of your readers, I don’t remember fairy tales in my life. They may have been there and I’m not sure I read them to my children. Life is filled with contrast (easy and hard) Fairy godmothers are few and far between but you do find them on occasion. My great aunt was one. I’ve learned a great deal here today. I think we missed a great deal in our gypsy lives but we always knew how to be resilient and that seems to be the essence of many of the tales. Given the time and opportunity, I’ll have to give them a read at the library. Thank you for sharing this. I’ve learned something today. Marlene, every time I read what you have to say I feel like you are my hero. You rise to the occasion, see everything, and have the best, most common sense thoughts and opinions. And you are always right. I can’t thank you enough for that. Resilience is the essence of most fairy tales. Your great aunt must have been the best. And I think you learned a great deal. Thank you so much for story and comments. You will probably enjoy reading these fairy tales. Best to you, my friend. You are right, Robin. There needs to be a balance. Read a variety of books. And many video games are fun and educational. My mother in law always said, “Everything in moderation.” Happy weekend! Thanks, Robin. Variety is the spice of life. Children need all the books and stories. I want to rewrite Snow White and Rose Red one day. A great fairy tale. I was surprised when first reading the more violent versions of Cinderella and other tales, too. Nice post, loved hearing about your mom’s life. Yes! Cinderella was a shocker to me. So glad you enjoyed this, Marcia. Exactly fairy-tales were once intended for ore of an adult audience, and there have been so many versions based on cultures and time periods, but the one thing that lives on they all have a touch of magic to live on and pass from generation to generation. I was so excited to read those fairy tales and Aesop’s fairy tales to my children and they hated them! They were too violent for them. I gave the books away! I remember when my young g.son watched 101 Dalmatians with me for the first time. I had to stop the movie and rescue him from his hiding spot. He was so very afraid of Cruela Deville and her ‘blokes’. I know exactly what you mean. My mother thought I was far too worried at Grimms. My kids did like 101 Dalmatians. Cruela Deville was scary, but they still liked the movie. I love fairy tales and have always liked the darkest elements of them the most. Guess I’m a bit twisted lol. Grimm’s are still popular, so you are not twisted. You just like good, dark stories.